Don’t read too much into Kansas, said The Wall Street Journal in an editorial. The Republican turncoats in the legislature are heavily backed by teachers’ unions, which wanted to punish the governor for his education reforms. 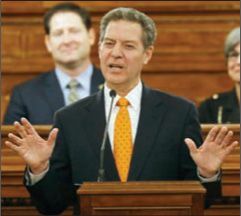 As for the tax system itself, Brownback was “unlucky in his timing”—his cuts coincided with a deep slump in the agriculture and energy industries, which drive Kansas’ economy. Unemployment in the Sunflower State remains low, at 3.7 percent, and the growth in small-business formation has been “considerable.” Brownback’s only mistake was to eliminate taxes on “pass-through” businesses. That “ created a loophole” that allowed firms and individuals to declare wage income as business profits— and pay “little or nothing” in taxes.